Many are blaming Obama, and he hasn’t shied away from the blame. By having high gas prices the Obama administration think they can get the American public to buy into electric vehicles and alternative fuel sources. DOE is working to promote alternatives such as biofuels and electric vehicles, Chu told House appropriators during a hearing on DOE’s budget. The problem is that Obama is faking the high gas prices. They don’t have to be this high, and he doesn’t have to get the American public to buy into the “green” economy and “energy independence”. 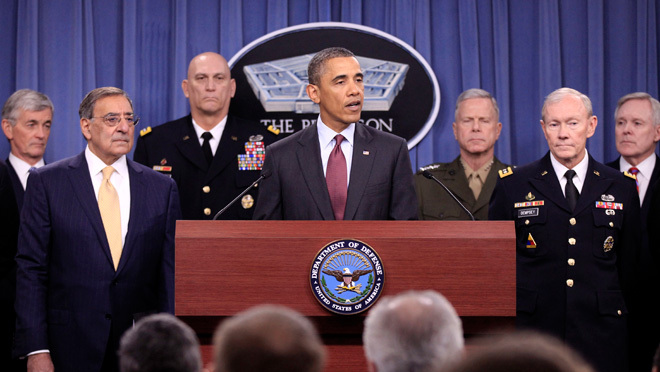 As the commander-in-chief, Obama can make the Department of Defense (DoD) focus on getting the military on alternative energy sources. As the largest oil consumer in the world, the DoD is the perfect player for funding the development of alternative fuels and renewable energy sources. Obama could mandate the DoD to consolidate it’s budget to completely focus on how to get it off oil using alternative fuels and renewable energy technology. If Obama were serious about getting America into a green economy, this is where he should start. By allowing the Federal Reserve to go unchecked with creating more debt-backed dollars, Obama and the congress are responsible for the devaluation of the currency. This is one of the biggest contributors to the increase in gas prices. Oil isn’t getting worth more, it’s just that the dollar is worth less. If congress took back the power of money generation, and changed from a debt-backed currency to Kilowatt hour backed currency, the dollar would regain strength, and we would purge the world of the parasitic private banks. Speculation of oil prices based on rumors of war and the growing demand from emerging markets. Our domestic oil production is the highest it’s been in 8 years (yes, that means Bush made less US oil than Obama). If you wants to point fingers, look no further than Goldman Sachs. Congress bares the responsibility of Wall Street Fraud. Darrell Issa and Michele Bachmann are working for the oil speculators by slowing down the rule enforcement of Dodd-Frank which is supposed to punish oil speculation. Obama should call them out specifically, and let the American people know that Darrell Issa and Michele Bachmann don’t represent the people, but they represent Goldman Sachs. Unfortunately, Obama also represents Goldman Sachs. Emerging markets demand has doubled world oil consumption in five years. To meet rising demand from emerging markets, Petrobas plans to increase production to 3 million barrels a day by 2015. Emerging markets include countries that account for a majority of the Earth’s human population. If they demand oil at the same rate per capita as the US, nobody will be able to afford it. Join with the emerging markets to develop renewable sources of energy in order to allow the United States to ween itself painlessly. The American people can have cheap gas while the green energy economy is inclubated by the DoD and DoE until it’s ready for civilian consumption. What is the big ‘deal’ about Solyndra? Why are we letting this company go? 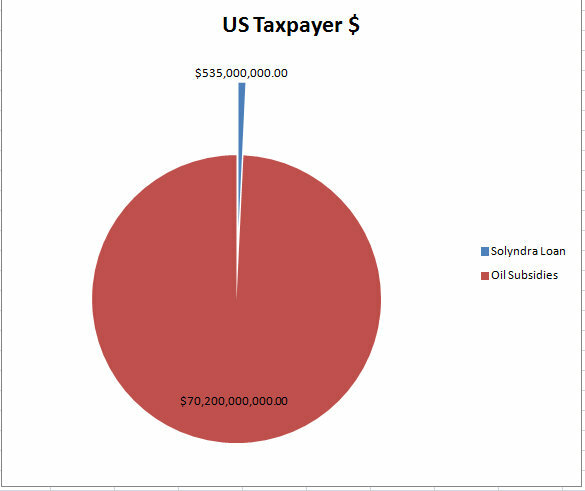 Compared to what we spend on subsidizing the oil industry the Solynda loan is a drop in the bucket. The oil industry does not need subsidizing. If we compare the annual big oil subsidies to the Solyndra loan, we gain the appropriate perspective of the issue. While the GOP House leadership seeks $60 billion in savings from programs including food-aid for pregnant women, public transportation and the EPA, Democrats say they can find most of that amount just from cutting oil subsidies. Bottom line: China has identified solar exports as a national priority, and it has tailored national policies and devoted national resources to achieving that goal. The strategy is working – at the expense of U.S. companies and American workers. The Solyndra technology seems so promising. Bailing out a company like this will return real benefits of improved energy production that fits into the plan of ridding ourselves of the need for fossil fuels. Unfortunately the US currency is based on the oil trade. We will not become energy independent until we change the way our money works. R. Buckminster Fuller had a great idea as described in his book ‘Critical Path‘. Instead of basing our currency on debt, we change our currency valuation to be a derivative of kilowatt-hours. If the dollar was redeemable for kilowatt-hours instead of being debt that had to be repaid to a foreign corporation, we would change the system to be supportive of energy independence from fossil fuels. I’ve just stumbled upon “Permaculture“. It completely resonates with my vision of becoming a nation of producers instead of consumers. Holmgren’s design principles are applicable to design systems of all kinds. I am looking forward to learning more about the application of the principles in my life. Let’s get with it people! I heard China will be importing electric cars by next year. Why are we not leading the world in alternative energy deployment? As we bicker over our failing banking system and where to drill, other countries are leapfrogging us in developing renewable energy solutions. Its amazing that we are still dependent on foreign states for our energy. The military should be the first energy independent organization under the US government to prove out the concepts and create markets of scale to be able to implement scaled down solutions for residential markets. While energy savings might be nice for civilians, it could be absolutely vital for the military. For example, if a terrorist attack dumped the electricity grid, an energy-independent Fort Bliss — or any military facility — would still be able to function and respond. February 2, 2010 The City of Palm Desert has announced the upcoming release of $6 million in new funding for its popular Energy Independence Program. Half of the new funds will be dedicated to loans for energy efficiency improvements with the other half reserved for loans for solar projects. The funding will be available to Palm Desert property owners who submit a completed loan application beginning Monday, February 8. Check out the only Solar power and Energy Efficiency company owned and operated in Palm Desert, California: Renova Energy Corp.
Are you a Geothermal noob? In an earlier posting I noted that geothermal energy is best in moderate climate zones. I think I may have been wrong and should have said “temperate” climate zones. I am also a geothermal noob. But thank goodness for the internet. It looks like Nevada is geothermal central.